This section is for photographs and information relating to the other companies who manufactured BEATL products (e.g Linga Longa, M.L. etc). Very little seems to be known about these companies, so ANY information would be greatly appreciated. 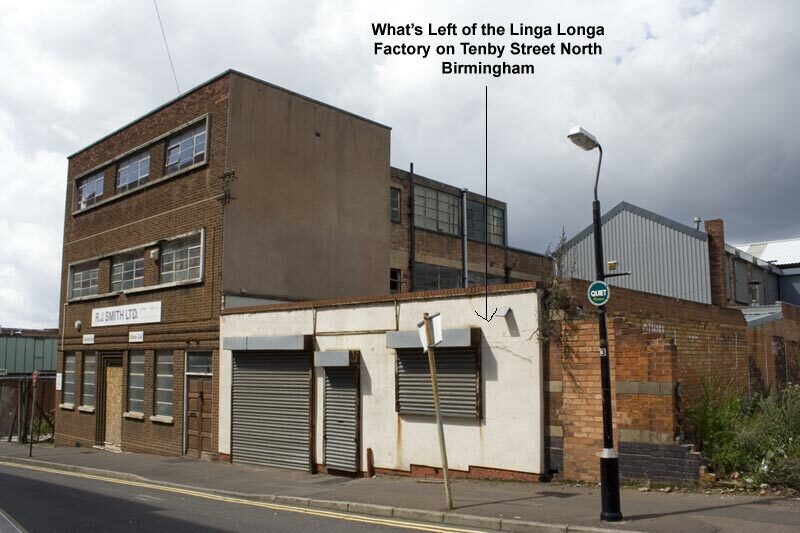 "Linga Longa" was manufactured by a Birmingham (UK) company called "C. Hughes and Co. Ltd." of Diadem Works, Tenby Street North, Birmingham. Unfortunately, the factory no longer exists. Oddly enough, this factory was only a few yards away from the premises of Joseph Lucas who acquired M.L. from Smiths Clocks (see below) and was in easy walking distance of the Bandalasta factory on Barr Street. In Kelly's directory for 1930, Christopher Hughes, the proprietor, is listed as a manufacturer of Fancy Goods. According to the trade mark representations directory, held by the National Archives, the name "LINGALONGA" was registered on 27th April 1928. 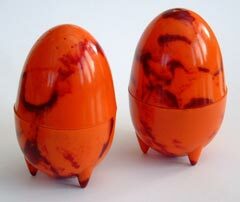 Linga Longa wares were marketed by BEATL Sales Ltd. and were sold alongside Bandalasta in the BEATL Shop. 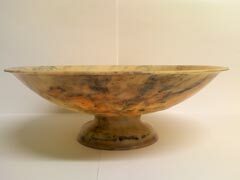 Small Bowl, diameter 4 in; height 1.75 in. 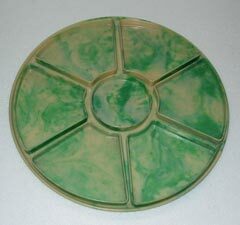 Teapot Stand, diameter 5.75 in. A Tea Set for Six. Containing 6 cups, 6 Saucers, 6 Tea plates, 1 Sandwich plate, Milk Jug and Sugar Bowl. What's left of the original box can be seen in the background. In the foreground is an extra trio with a smaller cup (numbered 811 or 311) and "scallop' cornered saucer and plate (numbered 830). Picture and info. courtesy of Lesley Russell. Picture courtesy of Chris Elliott. 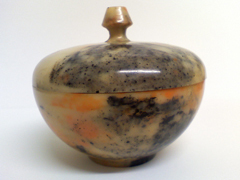 A small Powder Bowl, diameter 2.5 in; height 2.5 in. Picture and info. courtesy of David Allen. 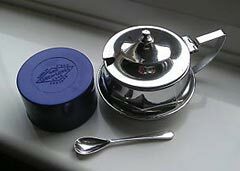 Small chrome mustard pot with LingaLonga insert. 806 Sandwich Plate Diameter - 6.5 in. 808 Drinking Horn or Beaker Height - 2.75 in. Diameter - 2.5 in. ; Height - 2 in. 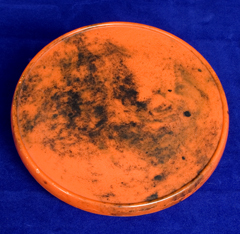 Powder Bowl with Lid Diameter - 2.5 in. ; Height - 2.5 in. Powder Bowl with Lid Diameter - 4 in. ; Height - 3.5 in. Diameter - 4 in. ; Height - 1.75 in. M.L. wares were manufactured by a Coventry (U.K) based firm called M.L. Magneto Syndicate Ltd. This company started out producing magnetos for the automotive industry. They were taken over in 1919 by Smith's Clocks who sold them in 1930 to Joseph Lucas. A reference on the Competition Commission website states - "The items in the Smiths List included clocks, petrol meters, pressure gauges, oil gauges, dashboard thermometers, sparking plugs and mechanical wipers, as well as a number of other items of car equipment and certain aviation instruments, Smiths was to continue to obtain its requirements of bakelite mouldings from M.L. Magneto Syndicate Ltd. until such time as it decided to manufacture such mouldings for its own consumption only, and it agreed not to compete with M.L. Magneto. 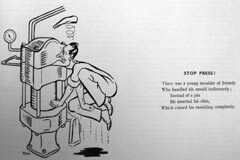 Car heaters, which in 1930 were practically unknown in this country except for very specialised uses, were not mentioned in any of the lists." The M. L. in the company name comes from the names of the two founders, Morris and Lister. M.L. 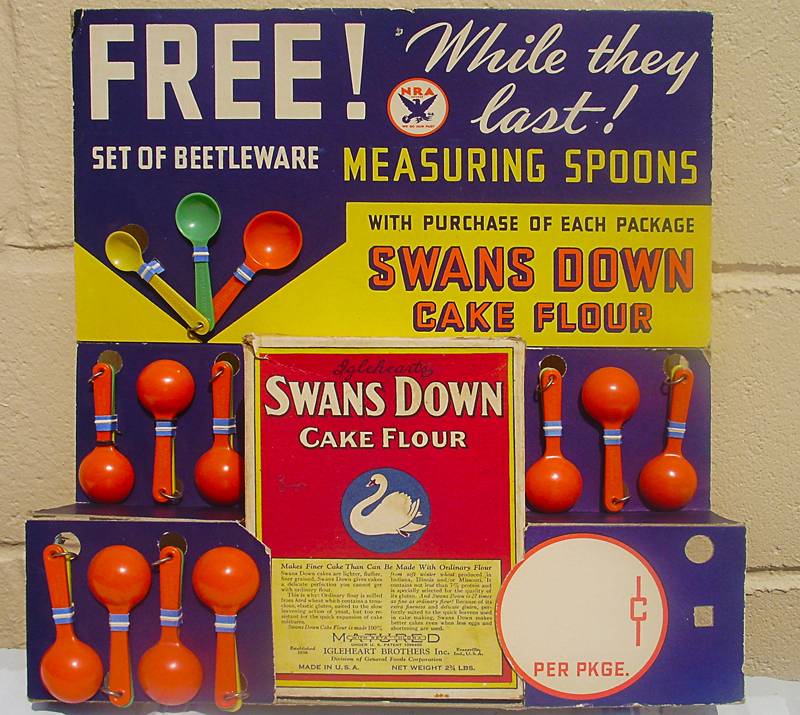 wares were also marketed by BEATL Sales Ltd. and were sold alongside Bandalasta in the BEATL Shop. Many items of M.L. ware are stamped on the base with the company name and a design code. 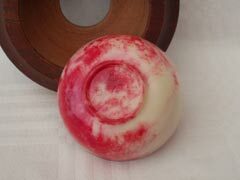 A 136 - Fruit Bowl, diameter 10 in; height 2.25 in, in a colour very similar to Banda Rouge. A Teaset for 6 in a lockable, leather carry case. 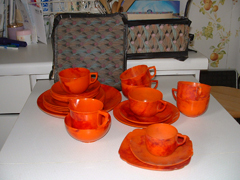 Containing 6 x 137 - Cups and 6 x 112 - Tennis Saucers in a variety of colours. Circular Tray 305-12 with Hors d'oeuvre inserts 148. Picture and information courtesy of Richard Cotton. An illustration of how much plastics must have been valued in the early days. This is a commemorative item from H.M.S. Iron Duke with a 257 Pin Tray insert. 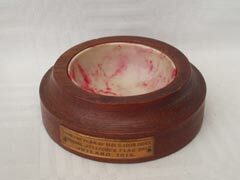 Plaque reads - "From the Teak of H.M.S. Iron Duke, Admiral Jellicoe's Flag Ship, Jutland 1916"
Another picture of the H.M.S. Iron Duke commemorative tray. Picture and information courtesy of Pete Beer. 106 Small Bowl Diameter - 3.5 in. ; Height - 2 in. 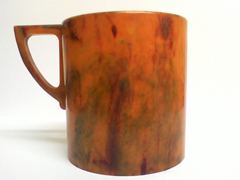 109 Mug Diameter - 2.5 in. ; Height - 3 in. Length - 8 in. ; Width - 6 in. 120 Saucer Diameter - 5.25 in. 124 Teapot Diameter - 4.5 in. (Excl. Spout and Handle); Height - 5 in. 136 Fruit Bowl Diameter - 10 in. ; Height - 2.25 in. Diameter - 2.75 in. ; Height 2.5 in. Length - 8 in. ; Width - 5.5 in. ; Depth - 4.5 in. Length - 7 in. ; Width - 5 in. ; Depth - 4 in. 257 Pin Tray Diameter - 3.75 ins. ; Height 1.5 ins. 305-12 Cicular Tray Diameter - 12 ins. 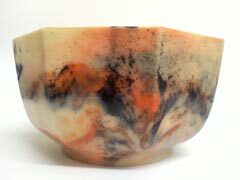 405 Footed Bowl Diameter - 8.5 in. ; Height - 5.5 in. 561 Drinking Horn or Beaker Height - 3.5 in. 578 Beaker Height - 3.75 in. Streetly Manufacturing Company were a Birmingham (UK) based company who were taken over by British Cyanides Company Ltd. in 1929. This company later went on to become British Industrial Plastics Ltd. Early mouldings from Streetlys are very similar to the wares of Bandalasta with a similar colour range. They are often unmarked but occasionaly have the initials S.M.C. moulded into the plastic. 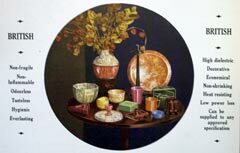 The company later went on to produce a range of tablewares for Woolworths using a new urea moulding powder which could produce mouldings in white, translucent and pastel shades. 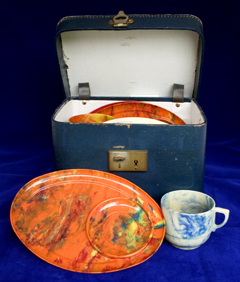 These wares were given the name "Beetleware"
According to "The Beetle" magazine . summer 1938 (as referenced in: - "Made in Birmingham, Ed. Barbara Tilson, Brewin Books, 1990"), Streetlys also produced a range of wares under the name "Beaconware". Beaconware was marketed by BEATL Sales Ltd. and was sold alongside Bandalasta in the BEATL Shop. And just to confirm it! And for a bit of fun!!!! Which ruined his moulding completely. 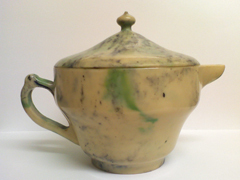 A lidded pot commemorating the coronation of King Edward VIII, marked "Beetleware". The Illustration is of a most striking Powder Box which is a two colour moulding job. 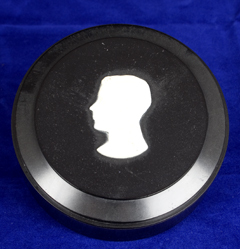 The ivory cameo head stands out clearly on the black background and the effect is exceptionally pleasing." 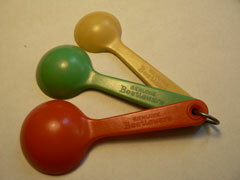 A multi-coloured set of measuring spoons, marked "Beetleware". 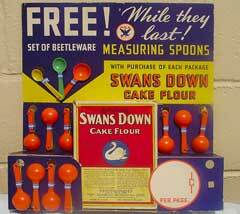 And a shop display for the same measuring spoons. 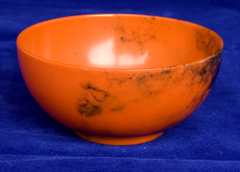 S27 - Bowl, Diameter - 10 in. ; Height 3.5 in. A bowl of this type is illustrated on the "Colours" advertisement for "The BEATL Shop", a link to a copy of which can be found on the "What Is It?" page. This section will contain items from companies other than the BIG four!. A small octagonal bowl, Diameter 4 in. ; Height 2.5 in. Maker unknown, marked underneath with a Beetle (see above right). 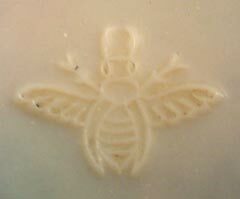 Beetle mark on base of the small octagonal bowl. If anyone has any info. on the origin of this mark, please let us know. More brightly coloured Beatl wares from "Belplastic". 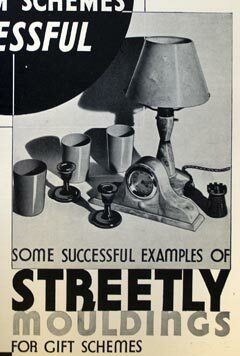 British Plastics & Moulded Products Trader, February 1932. Looking at the items on the table, it would seem that "Belplastic" were the moulders of "Linsden Ware".